Disney (DIS) will report their fiscal Q1 earnings Thursday after the close. The options market is implying about a 3% move in either direction post results which is rich to its average one-day post-earnings move over the last four quarters of about 1.7%. With the stock at $112 the Feb 8th weekly 112 straddle (the call premium + the put premium) is offered at $3.30 if you bought that, and thus the implied weekly movement, you would need a rally above $115.30, or a decline below $108.70 to make money. (8) the launch of Disney+. My Take into the print: With all of the questions and catalysts I am hard pressed to think that investors do not give DIS management a couple quarters this calendar year to execute on these massive strategic initiatives that have been in the works for over a year. It would take some dramatically increased costs associated with OTT roll-out and messy Fox integration guidance for the stock to go materially lower. Trading just above a market multiple, the stock is very cheap to its historical multiples, but I suppose the ytd underperformance highlights investor trepidation on execution, plus the consumer discretionary exposure from the parks, which is a third of their sales. So what’s the trade? 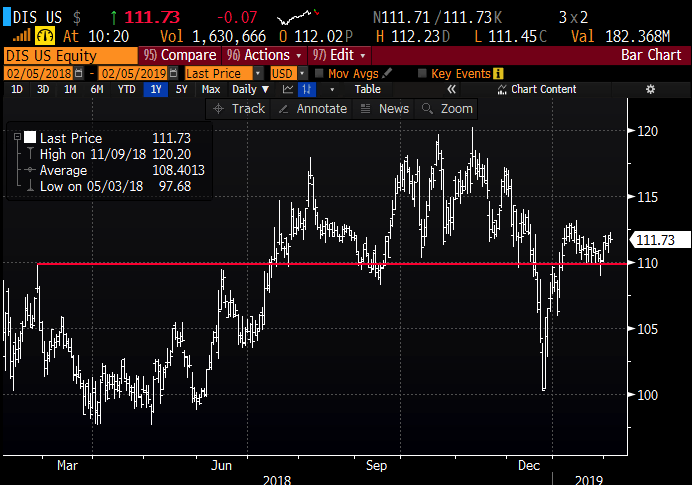 The implied move is so cheap that for those with a strong directional inclination, the at the money put or call with the stock at $112 are each offered at about $1.65, or about 1.5% of the stock price, which seems dollar cheap. 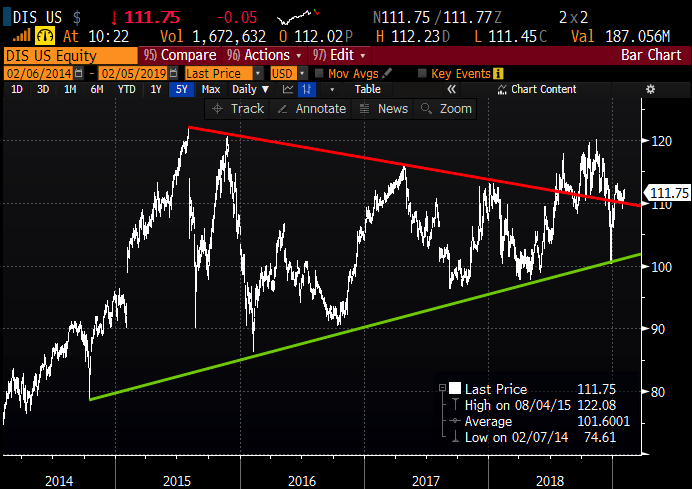 But as we like to warn, long premium directional trades with weekly options into events like earnings tend to be very binary, get the direction wrong and you are likely to lose most of the premium paid. This trade performs best with a gradual move towards the 115 strike over the next week and a half into Feb 15th expiration. If the stock is below 115 on Feb expiration the short 115 call will expire worthless and the trade will be left naked long the April 115 call. If the stock is close to 115 then the April 115 call should have appreciated as it will have picked up deltas. At that point it might make sense to further reduce the premium at risk by selling a higher strike call in April turning the trade into a vertical call spread. The max risk of this trade is the $2 in premium paid, and would be at risk with a large move below the current level, or well above the 115 strike. rationale: this trade idea risks 15% of the stock price for exposure down about 11% in the next 6 weeks, could be used as cheap protection for longs or an outright bearish bet.